Great for that Customized Look. Ideal for shaved door handle aplications, these units have over 40 Lbs of force and are specifically designed for the Hot Rod market. Each unit comes with mounting instructions, waterproof switch and mounting hardware. 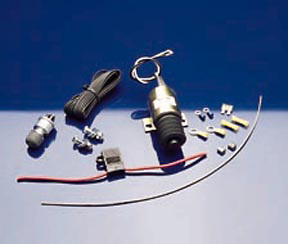 When purchasing the 40 Pound Solenoid Kit (with Hardware), consider the other items listed below. You can add all desired items from below at one time by clicking the Suggested Items Add Page link.